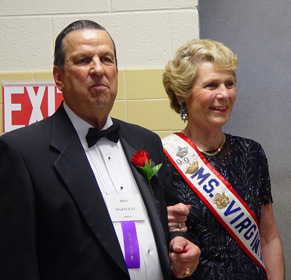 Elsie and Don at the 2005 Ms. Virginia Senior Pageant. Elsie Bartlett was born in Hopewell, Virginia. She currently resides in Fairfax Station, Virginia, with her husband, Don, of 56 years. Don and Elsie were married in Hopewell, and then moved to Don's hometown of Chicago, Illinois, for their first year of marriage. In 1954, they moved to Northern Virginia where they have lived ever since and raised their three children. Elsie won her title of Ms. Virginia Senior American in 1997. In addition to the required philosophy of life, evening gown presentation, and personal interview with a panel of judges, she performed a jazz dance routine. Elsie has always been involved with music and dancing, starting with dance classes at age four. During her high school years, she was the Head Majorette of the high school band and was involved in all of the musical productions. Elsie's dancing continued during her college years where she studied Modern Dance. For many years now, she has been singing and dancing as a front-row performer with the Vienna-Falls Chorus of the Sweet Adelines International. Elsie is an avid tennis player and plays several times a week on various teams for the Country Club of Fairfax. She has been the women's doubles champion a number of times over the years. Also, Elsie is a volunteer for the White House, where she has served many years with multiple administrations, and the volunteer coordinator while working with the activities department at the Commonwealth Care Nursing Center in Fairfax, Virginia. Elsie currently presides as President of the Ms. Virginia Senior America Cameo Club, whose members consist of women who have been contestants in the State pageant.